Can you spare three hours to learn how to beat the market? As unlikely as it may seem, hedge fund manager and professor Joel Greenblatt, whose investment firm has averaged 40% annual returns for over twenty years, can teach you how. You can achieve investment returns that beat the pants off even the best investment professionals and the top academics. In fact, you can learn how it's possible to more than double the annual returns of the stock market averages. But there's more. You can do it all by yourself. You can do it with low risk. You can do it without making any predictions, and you can do it by following, step by step, a time-tested, proven "magic formula" that uses only common sense and two simple concepts. Best of all, once you are convinced that it really works you can choose to do it for the rest of your life. 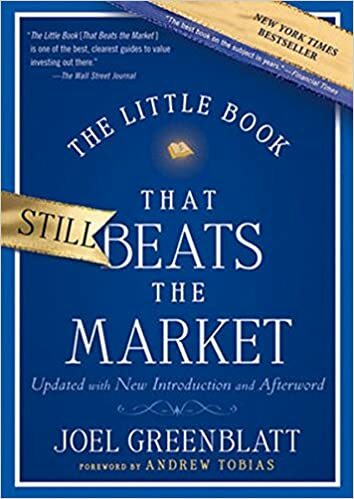 A runaway bestseller even before it was published, The Little Book That Beats the Market shows how successful investing can be made easy for investors of any age. It's never too early or too late to start investing, and with Greenblatt as your guide you'll know exactly where to go and what to do. By following the clearly outlined simple steps and magic formula, you can achieve extraordinary long-term investment results with a very low level of risk.